I have been having a nice Thanksgiving Break. On Wednesday we went to the Dinosaur Museum, and Gavin LOVED it. He would run from dinosaur to dinosaur. We had a nice Thanksgiving at my parent's house this year. It was just us, Autumn and Doug and Logan and Camille, so not a big crowd. Today I did wake up and went out Christmas shopping. I got quite a few gifts and was in the Christmas mood, so I came home and set up the Christmas stuff and wrapped presants. Casey and I then went on a date to see "Four Christmases", which was very funny. I hope you all had a great Thanksgiving! Uncle Logan was hiding in the cave scaring Gavin. He thought that was so funny. Making a mess in the sand. I had to take this picture of Gavin and Braxton on Thanksgiving. They were playing so good. Christmas...here we come! Gavin was so helpful setting up the tree. He was so funny and would help straighten the branches. He loves looking and touching the "balls" (ornaments) and the lights. Everyday, it seems like there is a new funny thing that Gavin does. Today, Gavin snuck upstairs and it was quiet for a while, so Casey went up to check on him. This is what he found...Gavin sitting in his hamper. It was so funny because we don't know how he got in there, without tipping it over. Casey is always trying to figure out new drinks to make. We have done root beer, cream soda, and the latest is Sparkling Apple Cider. It is so easy, and tastes just like what you buy at the store. Gavin loved it when we put the dry ice in. Whenever Gavin sees the camera, he says "Cheese! Click!" He loves getting his picture taken. We had a nice surprise waking up to find lots of snow on the ground. Gavin loved looking out the window and watch the snow fall. I bundled him up and took him out for a few minutes, but he didn't really like the cold. I don't think it helped that Casey was throwing snowballs at him! He looked so cute walking around all bundled up. Happy Halloween! We had a fun and busy day. Gavin was a cute little pumpkin and I was Peter Pan, and Casey was lucky he didn't have to dress up! We basically just visited friends and family. Gavin really liked getting candy, and running to the door when trick-or -treaters came to help give out candy. After trick-or-treating, we went to Kristine and Andrew's for a little Halloween Party. It was a great day! Happy Halloween! A pregnant Peter Pan, you don't see that everyday! I left my camera at Kristine and Andrew's, and so when I got it back, these were the pictures I found on it...thanks guys. Gavin has just recently found out how fun blankets are. He doesn't just grab one blanket, he has to ge all his blankets and carry them all around the house. This morning, I was getting ready, and noticed he had been quiet for a few minutes. This is where I found him, happy as could be, snuggled in his blankets. Have you ever wondered who makes the speaker nobs on the stereo? The arrowheads on hunting arrows? The tiny screws that go in the NEW YEARS EVE BALL that is dropped on Times Square? Well, these are a few examples of what Casey makes at work. I thought it was neat they got a job making some little screw that is going inthe New Years Eve ball that is dropped on Times Square. 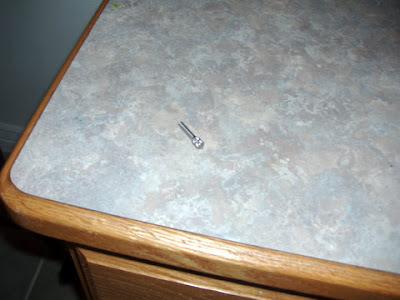 Here is a picture of the screw, made by Casey!